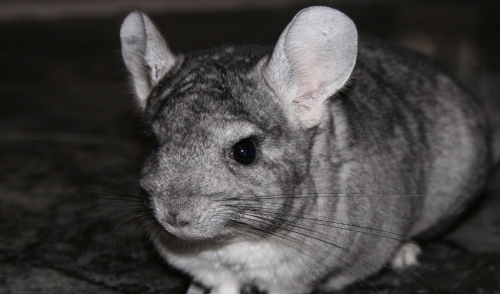 With their charming and perky personalities, chinchillas can be fantastic pets. Their most outstanding characteristic, however, is their lush, soft, silky fur, a thick coat that is specially adapted for their native home in the Andes Mountains of South America. Unfortunately, when these unique critters are pets, they can be susceptible to several conditions that can damage their luxurious coats. If you understand their proper grooming needs and fur care, however, you can keep your chinchilla happy and healthy with an amazing coat. Chinchillas are naturally neat animals that self-groom regularly, which means very little supplemental grooming is ever necessary for a healthy pet. Dust baths are their preferred method of grooming, and it is essential to use very fine, powdery sand formulated for pet chinchillas – see your local pet store or veterinarian for appropriate recommendations. In the summer when heat and humidity is highest, they may need frequent dust baths, while in the cooler, drier winter the bathing frequency can be decreased. Simply put a shallow tray or dish with the dust into their enclosure, and they will happily and enthusiastically roll, shake, shimmy and burrow to thoroughly coat their fur. The dust absorbs oil, grease and dirt, helping keep their coat in peak condition. It is not necessary to brush a chinchilla, and most do not enjoy being brushed. A long-toothed comb can be used to help remove mats from their fur if absolutely necessary, but it should be done very gently and with as little stress to the animal as possible. 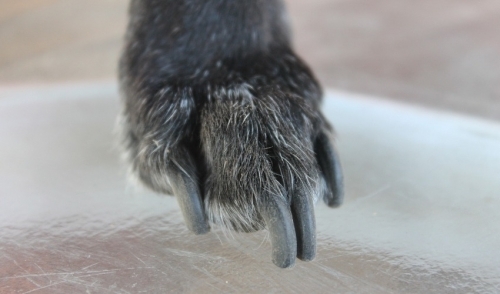 The only other grooming that may occasionally be necessary is trimming toenails if they are not naturally wearing down quickly enough. Though chinchillas generally have few problems with their fur, there are occasional difficulties that can turn their normally luxurious coat into a greasy, matted, patchy mess. Understanding these problems and their causes can help you get your chinchilla's fur back into prime condition. Shedding Excessively: These pets can be quite nervous, and while some shedding is normal, if they are heavily stressed they may shed excessively. Moving the chinchilla's cage to a quieter, more peaceful location and making the cage more comfortable can help alleviate stress. Wavy, Weak Coat: If the animal's coat is growing wavy or if the fur breaks easily, it may indicate dietary deficiencies and too much protein. Chinchillas naturally eat grass, leaves and similar plant material. If your pet has too much protein, gradually adjust their diet (slowly to prevent digestive complications) to help correct coat problems. Greasy Fur: A chinchilla uses dust baths to absorb and remove excess body oil. When the coat grows greasy and oily, it is best to increase the amount of time the animal is allowed for dusting, as well as to increase the frequency of dust baths. Even daily baths can be acceptable as long as the skin is not drying out. Bald Patches: Stress and boredom can create bald spots on a chinchilla's coat, whether the fur is falling out naturally due to the uneasy conditions or the animal is biting its own fur. The solution is the same – a lower stress environment, more toys for stimulating play and good comfort to help the chinchilla feel at ease. Clumped or Matted Fur: High humidity can affect a chinchilla's coat by creating thick clumps or mats that can be difficult to groom. Because these animals evolved in a low humidity environment, they have difficulty coping with extremely different climate conditions. Adding a dehumidifier to the home and increasing the frequency of dust baths can help. Fur Slip: A single bald patch where the fur has fallen out in a clump is called a fur slip, and is a defensive mechanism chinchillas use, releasing their fur when they are caught by a predator. In pet chinchillas, this is often caused by rough or improper handling, or the animal may have gotten caught on something in the cage. Always handle a chinchilla gently, and inspect the cage regularly for hazards. It is also important to note that fur problems can be symptoms of deeper health concerns. If your chinchilla has ongoing coat issues, be sure to seek appropriate veterinary help for an expert diagnosis. Working with your veterinarian, you can provide excellent care for your chinchilla to be sure its coat is always looking its best.